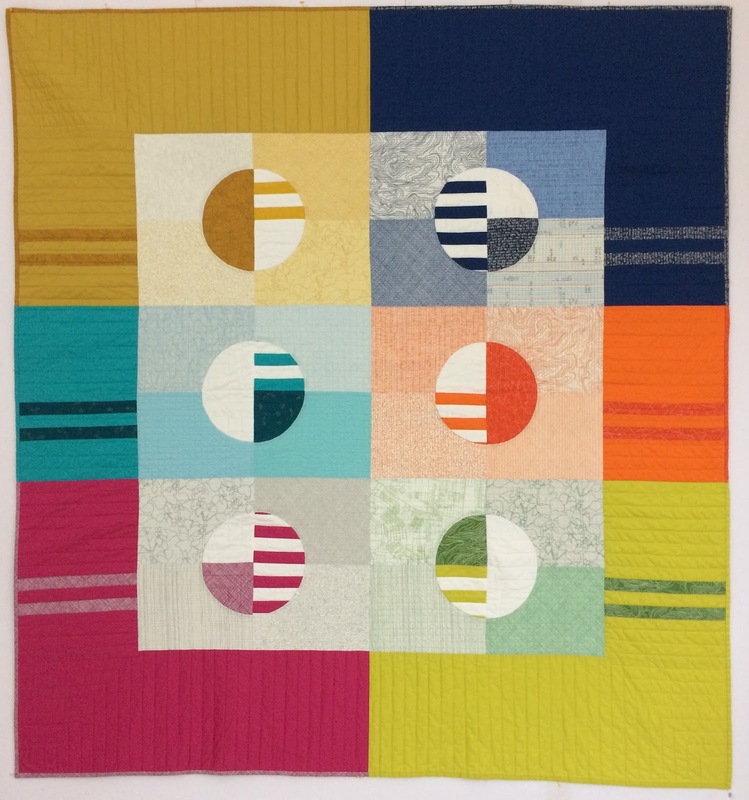 Greenville Modern Quilt Guild had two members receive awards on their quilt entries in this year's MQG QuiltCon in Savannah, GA. Our award winners are..........Paige Alexander and Cheryl Brickey. We congratulate you both and are so proud of your accomplishment. Leslie White and team at Bernina Sewing Center presented both Paige and Cheryl with "festive star balloons" and gifts to honor them. Cheryl Brickey - 1st Place in the American Patchwork & Quilting Nine Patch Challenge entitled "Warp and Welt"
Paige Alexander - 2nd Place in the Small Quilt category entitled "Cursive"
Paige Alexander - 3rd Place in the American Patchwork & Quilting Nine Patch Challenge entitled "Mustard Stain"
And, we cannot forget our GMQG Charity Quilt. As you entered the hallway where the charity quilts were on display.....there it was right at the entrance. It's fun to see it hanging there.....again, great work to all who contributed to this project. 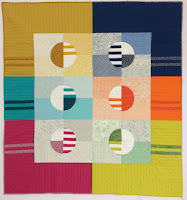 As mentioned, GMQG charity quilt will be donated to Habitat for Humanities in Greenville, SC. Thank you, Madeline Faner for volunteering to deliver it to them. Check out all the winning quilts at QuiltCon East show here at Modern Quilt Guild 2017 Award Winners including Best in Show. GMQG extends a huge "THANK YOU" to the Modern Quilt Guild Organization. We know you worked tirelessly and made it look effortless in bringing the scope of the show together. You hosted a mammoth event that we all here in Greenville, SC celebrate, appreciate and enjoyed. Our meeting this month was about our experiences at QuiltCon. As I listened to the various comments and feedback, it made me envision a quilting bee sitting together around a quilt in progress. We have come to know each other, so we could talk openly and candidly. It was good to hear each others perspectives, likes and/or dislikes, ideas, inspirations....and more. If I could summarize our talks, I would have to say GMQG is enthusiastic to continue to be a part of defining "modern" quilting. And, to further challenge ourselves in thought, design, technique and workmanship. We had a good turnout this meeting. Paige Alexander reported a total of 31. We also had seven (7) new members to join GMQG -- "WELCOME" bringing our membership total to date at 58. Door prizes are fun. We had nine (9) giveways this month that included various items like a MQG water bottle, books, fabric quarters, patterns and more. Congrats to the lucky winners. March 27th, Leslie White wants you to join her at Bernina Sewing Center for cutting up fabric scraps with AccuQuilt cutter. To learn more contact the store at 864-235-5031. Good job to those who challenged themselves to Ellen's Snowball designed by Cath of Wombat Quilts. We had five(5) who submitted their take on this quilt block and I have to say they looked spectacular. We look forward to seeing the quilt made utilizing these blocks. It is going to be an eyecatcher! What is the March Block Challenge? We appreciate Faye Jones for keeping GMQG proactive for the cause in making cuddle/comfort quilts for children who have been removed from an abusive situation. And, now, as she mentioned (and received our show of hands in approval) to expand our reach to the Julie Valentine Center. This center works with both Women and Children in sexual assault cases. At a low moment in life, the beauty of a "comfort" quilt is a huge blessing in healing the human spirit. Thank you to all who have generously given quilts to date AND thank you to many of you who brought quilts this past Saturday (see in Show & Share). First of all ---Blow the trumpet, please --- it's "Block Recycle Challenge" unveiling!!!! 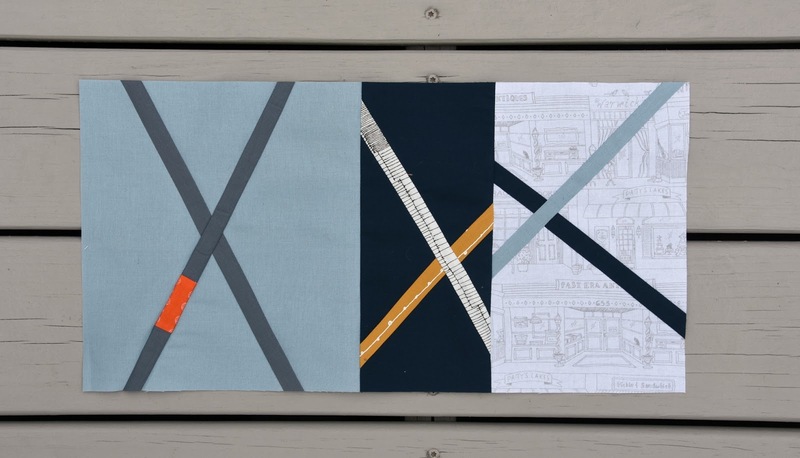 This is going to be so much fun seeing how each of you transformed an unfinished, packed away and/or unloved quilt square that was brought in by one of you. As you know, Faye Jone's theory and challenge to us was a hidden away quilt square could be the inspiration to another. Our goal is to prove her right next month. Faye will present prizes to the winners. Last but not least, Cindy Lammon and Faye Jones will present a lecture on "Copyright in Quilting"